Paul H. Lange, MD, FACS is chairman emeritus of the Urology department at the University of Washington. He received his B.A. from Lawrence College and his M.D. from Washington University Medical School. 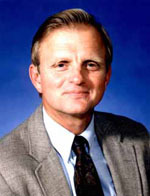 He subsequently received clinical and research training at the National Institutes of Health, Duke University, and the University of Minnesota. He has served on many editorial boards, including that of the New England Journal of Medicine, and is a member of many professional and honorary societies. Dr. Lange is internationally recognized for his clinical and research work in a variety of genitourinary cancers, including prostate, testis, bladder and kidney, and he has authored more than 400 published articles, chapters, and books on oncology. Of particular note, he helped develop serum markers for testis (AFP, HCG) and prostate (PSA) cancers. Dr. Lange currently directs a large clinical practice in urologic oncology and is co-director of the department's experimental laboratories in genitourinary oncology which focus on molecular studies in prostate cancer. In that capacity he serves as principal investigator on a Program Project grant and the Pacific Northwest Prostate Cancer SPORE. He is currently serving as a member of the American Board of Urology.